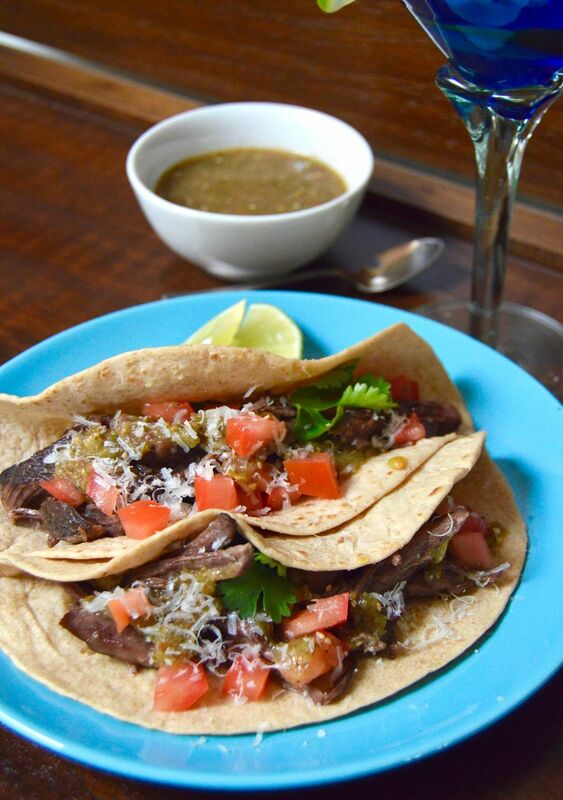 Simple Short Rib Tacos with Homemade Tomatillo Salsa out of the leftovers from the day before in less than 30 minutes! An easy recipe that’s both fast and delicious! A complete win/win! …. The holidays are over and one of my readers pointed out I’d neglected to post the 2-fer part of the Braised Red Eye Short Ribs. Yikes! The holidays were a blur but I promise these Simple Short Rib Tacos with Homemade Tomatillo Salsa were worth the wait! My mom was so good at always having delicious foods for us. They usually weren’t super fancy but they all had one thing in common. They were made with a few simple ingredients. Mom would have a roast one day with all the trimmings, then sandwiches from the meat the next. She might spend a lot of time one day cooking, but the next day it was just a few things added on to make a completely different meal. I appreciate this way of cooking so much more now than when I was younger. Time seems so short anymore…. always running from here to there and everything seems to take so much longer to accomplish anything these days. 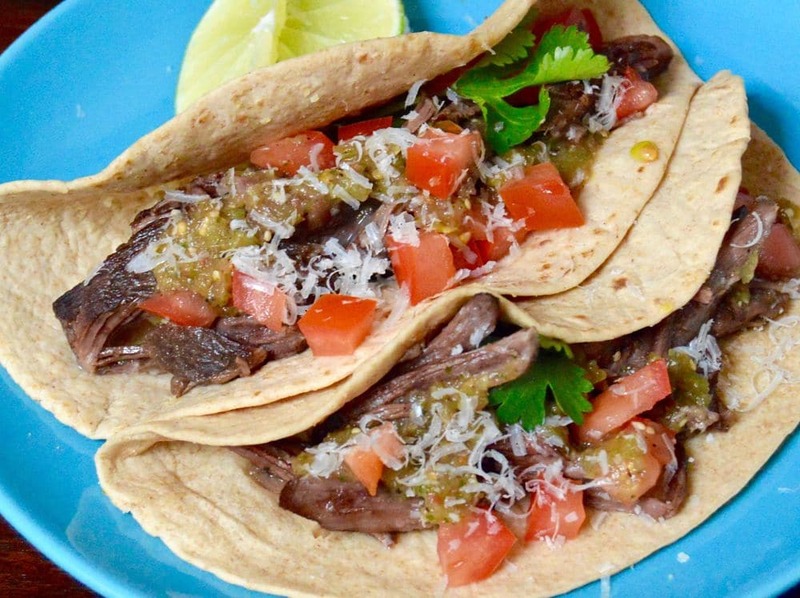 These Simple Short Rib Tacos with Homemade Tomatillo Salsa are an excellent way to illustrate my mom’s time saving methods for you. The Short ribs are an inexpensive cut of meat and by slow cooking it with just a few things for a long time you get a warm and comforting meal. If you double up on the rib portion (see original recipe) then one of the following days you can make these tacos. I pull the short ribs out before I put the gravy on them in the first recipe, which allows you to have two very different flavored meals with just a few additional ingredients for the second meal. I bought store bought handmade tortillas at Trader Joes for the tacos. (Under $2 for 12 tortillas? I really can’t make them any better or cheaper than that.) You pull the meat apart with a fork and warm in a sauté pan slowly. The only other thing I add to the taco is a fresh slice or two of avocado. The warm meat, with the tangy salsa and the creaminess of the avocado? It’s amazingly delicious! 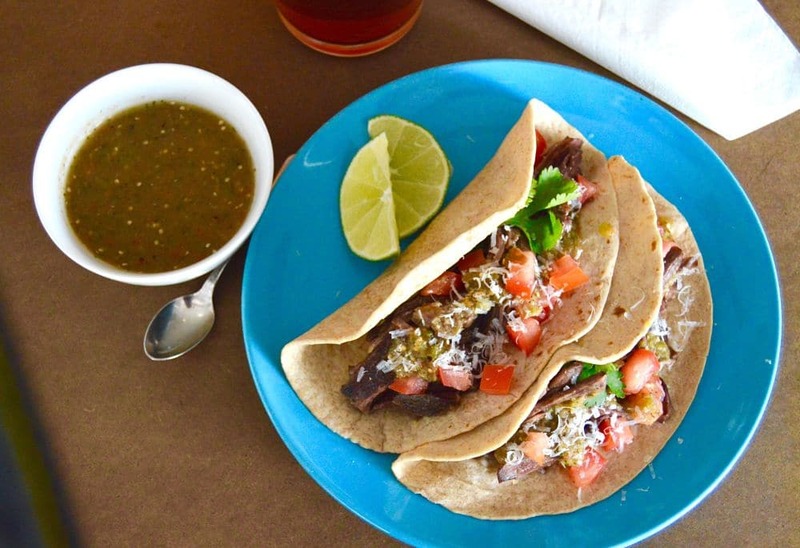 Let me know your thoughts about these Simple Short Rib Tacos with Homemade Tomatillo Salsa! If you like this recipe, you could use the leftover meat from my Spicy Beef Brisket or Pulled Pork to make these tacos/salsa too! Simple Short Rib tacos with an easy homemade tomatillo salsa out of the leftovers from the day before in less than 30 minutes! An easy recipe that’s both fast and delicious! A complete win/win! Place leftover ribs on a cutting board and pull the meat into bite size portions. Place 1/4 cup chicken broth or water in saute pan and add rib pieces. Heat to medium, slowly warming the rib meat. Once meat is to desired temperature, turn heat to low to maintain warmth. 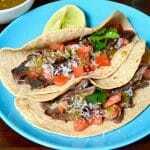 Build taco by placing meat in tortilla, topping with chopped tomato and salsa to taste. Sprinkle top of tacos with parmesan cheese. (I grate it fresh, but in a pinch the Kraft green canned style works great!) The parmesan adds a nice depth of flavor! NOTE 1If you don't want to make the red eye ribs, or if you realize you ate even your extra portion of ribs you can make the ribs as follows. Take 2-3 lbs of boneless ribs and season with salt and pepper. In a stock pot place 1-2 tablespoons olive oil and heat to high. Flour rib meat and then place in warmed oil and brown on all sides. Then remove from pan. Add another tablespoon of oil and place 2 cloves garlic and 1/2 small diced onion in to brown. Then place ribs back in pan. Pour enough chicken broth to cover ribs. Bring to a simmer (small bubbles coming up) and allow to braise for 1-2 hours. Season the broth with salt and pepper. You will know when the ribs are done when you can easily pull them apart with your fork (no knife necessary.) Remove ribs from the broth and then follow current recipe for tacos. Alternatively you can place all of these ingredients in a crock pot overnight. NOTE 2 Place the same number of tortillas per person in different foil bags. For example, for three people your first foil packet will have 3 tortillas. That way when you go to make the second round of tortillas they are in an unopened packet and are still nice and warm! A simple salsa to add flavor to any meet. Serve on the side for chips, or over any meat. Works great on tacos or just as an added flavor boost to meat alone. Once all the sides are blistered, place them in the base of the food processor or blender. Add the rest of the ingredients (salt, remaining olive oil, cilantro(optional) and salt. You can serve immediately or store in an airtight container in the fridge for several days. NOTE 1 If you are concerned over the dish being too spicy, once you have blistered the edges of the jalapeño cut the pepper in half and remove the seeds. You will get a much smaller blast of heat by removing the seeds. These look amazing. I’m saving these for my next taco bar get together. OMG, Michele. Yum yum yum! These looks delicious and authentic like they are made in Mexico. All you need now is a margarita to go with them. Yum. I love tacos and I’m always looking for new things to put inside. Will definitely be trying this soon. Pinning. This looks good and healthy! I do enjoy this style of cuisine. Tacos are one of my favorite dishes, so versatile. I love the use of the short ribs and the tomatillo salsa gives it a nice touch! I love tomatillo salsa. They’re so good. Simple food with few ingredients is a time saver. So great for busy midweeks. Im in for any time-savers these days too! ~thanks for stopping by! I love leftover meals, and this sounds so tasty right now. That’s a great price for tortillas too. I never find them that low! I just have to make these! Definitely adding this recipe to our Taco Tuesday list! Love the tomatillo salsa! Taco’s are my favorite, i can eat them all day! These look so delicious, cant what to try!! Well, yum!! These look so good! Yum!! I’m obsessed with tacos and make them at least 3 or 4 times a month. Never thought of trying short ribs though! Two meals out of one is the absolute best! These tacos look delicious and I look forward to trying the tomatillo salsa. Tacos are so delicious and wholesome! I would love to try these..